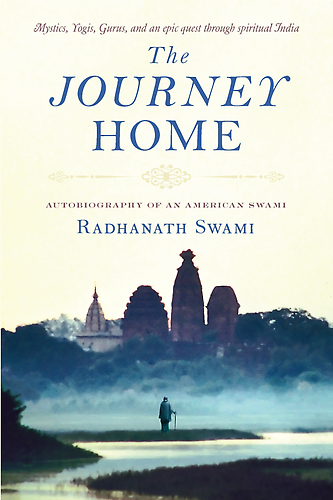 I write about in this book that recently came out – The Journey Home, the time I spent with Mother Teresa in Calcutta, in about 1971. And I remember she told me something, very striking. She said that the greatest problem in this world is Hunger. Not Hunger of the stomach, there is a lot of that. The real problem is the hunger of the heart. And because of that Hunger of heart, there is so much of hunger of the stomachs too. She said that there is only one nourishment that can satisfy the heart. That is Love. To Love and to be loved. If somebody has everything else but not that…. the heart is empty. And in that emptiness we have to somehow or other divert our attention away from the loneliness and the pain and the futility of our lives. And we try to fill it with all kinds of sensory entertainment and all kinds of accomplishments and all kinds of …sometimes Drugs and alcohol just things, to divert us from what’s within. A rich life is when we find a treasure, when we find love within ourselves and that naturally manifests as compassion towards others and that our actual motivation. Whether we are little swamis just travelling around without any real resources or whether we are farmers or doctors or lawyers or teachers or politicians or millionaires or billionaires. They are all potentially wonderful, if we have a right… fulfilling motivation behind it. 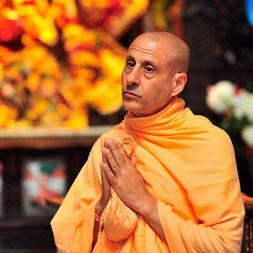 Meaningful life is a fulfilling life – Radhanath Swami. It was Gandhi who pointed out that in the world we live in, there are sufficient resources for everyone’s need, but insufficient resources for everyone’s greed. If greed is curbed, there won’t be starvation in this world. But how to curb insatiable greed? We have to turn to spirituality. 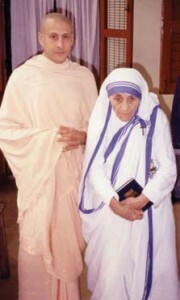 In this audio clipping Radhanath Swami shares some details of this meeting with Mother Theresa. He tells how a hungry heart leads to greed which leads to many hungry stomachs. 7 Responses to "The Greatest Problem is the Hungry Heart"
Very nice. Thanks for sharing it! People have hungry stomachs as well as hungry souls! Its people like HH Radhanath Swamiji Maharaj who make this place called earth worth living . Such deep truths about life expressed in such simple words – absolutely divine spiritual bliss!